When Ekta enters Payal Khandwala’s room, she instantly gravitates toward this freshly arrived pale pink brocade le-henga as it’s being hung onto the rack. “It’s such a beautiful piece and it has pockets!,” exclaims Ekta as she tries it on with a slinky shirt and an Eka striped jacket. 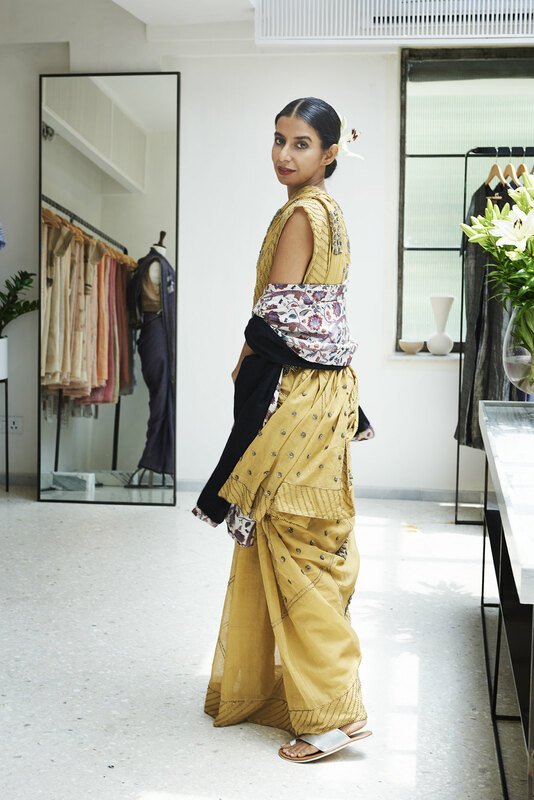 “Jackets over saris, lehengas or even kurtas, are such an easy way to contemporarise the traditional clothes.” She twirls around in the lehenga, her hands snug in pockets, jacket sleeves rolled up, and she says — “This is my favourite look. I feel like an actual model in this.” We just stare at her, as do the other weekend shoppers. And we couldn't agree more!